The DataCloud 2.5 project is a new version of DataCloud 2.0. DataCloud is an ongoing Art and Research project about information spaces. 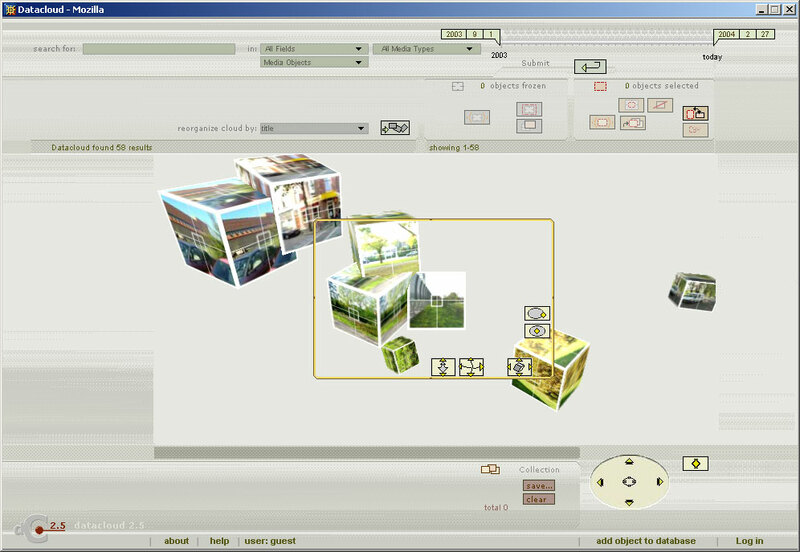 Information Spaces combine the possibilities of new media, databases and a computer-generated environment to give users insight in complex collections of information. The result is a digital environment that combines the characteristics of knowledge maps (based on objective relations) and mental maps (based on subjective relations). It is therefore capable of structuring information in a rational, but also in a more associative way, using its computational abilities to analyse and represent the relations between information items. For this version the team compiled a wishlist of functionalities to improve compared to the previous version. On top of this list was the overall performance of the application, followed by a good working reorganization algorithm (the clustering of 'similar' media objects). Also we wanted to clarify this reorganization by making use of animation. Unfortunately the budget for the project was cut in half, so the main goal we set was the creation of a presentable demo that would explain the ideas behind the DataCloud project in order to request additional money. DataCloud 2.5 goes a lot further than a demo. A moderation tool was built that allowed the content team to add and delete media objects, keywords and users. 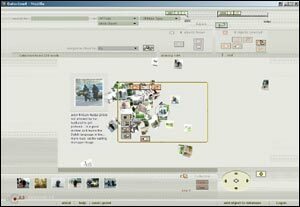 A shockwave client application was made with functions for searching and browsing media objects and collections, for reorganizing the objects in the view on their metadata, and for adding and creating media objects, collections, and comments. The modification date and the number of times a media object is commented and viewed is used to present registered users with new, popular and active objects when they log on. Because of the tight planning, we decided to re-use a lot of the work that was done for Amicitia. The technical backside of the application is completely independant of the client side. This is very useful during development time, and it allows the use of another client than the one we made now. On the server side we used Tomcat webserver, XML Xindice database and java servlets. For the moderation tool we used JSP and the public web interface is a shockwave client. The most important change and improvement is the way the data can be (re)organized. The reorganization is now taking place in a true 3D volume, instead of on the surface of a sphere. Because this process is animated the user can follow what is happening. Also we changed the 'complicated' dialog for creating a metadata cocktail, with a simple listbox of presets. Many people still seem to have this desire for a cocktail, but experience tought us that it just doesnt work. It doesn't really make sense either. In my mind the interaction should happen mostly by navigating and interacting with the objects in 3d space, instead of having a bunch of nifty 2d dialog controls. Think of the following scenario: A user explores the objects in the space which are all about the city of Rotterdam. He reorganizes the cloud on 'location' and navigates some clusters. There's a large cluster around a building with the name Las Palmas. 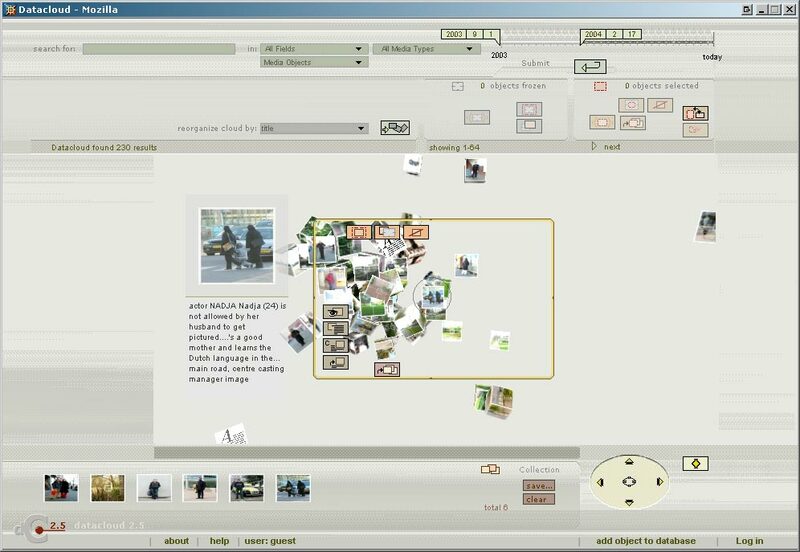 He then filters out the non-Las-Palmas objects and reorganizes on 'date' to get a visualization of the events that took place at this location in time. It makes no sense to reorganize the objects on location and date at the same time! To find out more about how reorganization works in DataCloud, read erik's A Self Organizing Principle. A change that is minor in my eyes, is the change from representing the Media Objects in the shape of a cube instead of a sphere. The majority of people ask about this, so here is why: First of all, a cube has less polygons and therefor makes for better performance. Second, the textures applied to it most often represent 2D media objects like movies, pictures and text, so a flat surface is better suited for this job. Third, the cube gave nice feedback to a mouseover by rotating to face the user. And finally.... we got bored with spheres :-). With all the implemented functionality, the 'demo' is a pretty complete application. What is really missing (besides more flexible code and a simple way for others to download and install DataCloud) is to search and reorganize on Media Object level instead of just Cloud level. Meaning the ability to click on an object and choose something like 'get similar'. Ofcourse there are a lot of things that can be improved or done differently. The major 'objection' I have to this version is that the interface doesn't seem to be as balanced and well integrated as, for example, Amicitia. All and all I'm happy with the result, and the nagging dissatisfied feeling that I was left with after DataCloud 2.0 is gone! In the summer of 2004 we customized DataCloud 2.5 for usage by The Office Of Alternative Planning (TOOAUP) of the Berlage Institute. This modification ran as an installation at the Manifesta 5, the European Biennial of Contemporary Art, in Donostia-San Sebastian.